1. Do no harm. This includes the obvious ways in which we might harm others (“brawling” was specifically prohibited, as were other things, including buying, having, or selling slaves), but it also meant that they would seek to be aware of and avoid any of the more subtle ways that harm and evil happen. When we do not have rhythms of resting on the Sabbath, or when we cheat on our taxes, or do things to others which we don’t want done to us, harm happens. 2. Do good. John Wesley never said one of the statements most often attributed to him, but it must have come from some early Methodist who was committed to the method. “Do all the good you can, by all the means you can, in all the ways you can, in all the places you can, at all the times you can, to all the people you can, as long as ever you can.” Even though Wesley didn’t write those words, it seems certain that he would have been in favor of them, as the method clearly included doing good and being merciful to the bodies and souls of all others, as far as we have opportunity. 3. Practice the means of grace. The early Methodists were committed to doing the things that would give God some open space to work in them. It wasn’t an option for them to do no harm and do good but neglect practices like prayer, reading the Scriptures, and receiving the Lord’s Supper. Just as it wasn’t an option for them to practice any one or two of the General Rules by while neglecting the others, neither was it an option for the early Methodists to live the method in isolation from one another. The only way to commit to their method was to commit to it together. After the Wesley brothers’ first group was given the insulting name of “methodist,” they allowed it to stick, since they saw the benefit of having a method in place for people who wanted to grow in their love for God and others. They recognized that groups throughout Christian history had lived by such methods, even if they used different terms for them. One such alternative term for “method” was “rule,” which rather than meaning (as we might understand it today) a standard which shouldn’t be broken, meant a lifestyle framework to which a group would mutually agree. It was as if to say, “If this is the kind of people we want to become, we recognize that we need to live together this way. Therefore, this is our rule.” Think of it less like the rules in a school handbook given by the principal to students whether they like them or not, and more like the way a successful athletic team agrees to arrange their lives in pursuit of their goal. Practice the means of grace. * Regularly answer, “How is it with your soul?” to others living this method. That’s it. We will unpack each of these briefly in the following post, but for now it’s important to understand that the early Methodists knew this method, because they understood that they were signing on to live by it together. They didn’t have the danger of considering themselves Methodists because it was a name on a building they entered on Sundays, nor because it was their heritage. The only relevant issue was whether or not they were in a group committed to living this way together. Can you imagine what kind of difference it might make if every person in a local church could name that method? What if all of us could? Or, to say it from the other direction, why can’t we? If we can’t name what the method of Wesley’s methodists was, doesn’t it mean that their method has ceased to be ours, and we are therefore neither very Methodist nor very Wesleyan, despite whatever other parts of their tradition we have tried to hold on to? Folks are often surprised for me to say that any such method ever existed. I have had more than one devoted, long-time Methodist say to me something like, “All these years, I thought the method part of our name had to do with the order of worship printed in the bulletin.” Thankfully, our tradition offers us more substantive guidance than indicating when it’s time for the ushers to take the offering. When John and Charles Wesley began getting together with a group of friends to discuss the state of their own souls–and were made fun of with the derogatory term “methodist” for doing so–I’m quite certain they did not expect that almost three hundred years later, there would be millions of people on the other side of the Atlantic Ocean still using the label they were given by others who disagreed with their methodical approach to spirituality. Surpassing that surprise would be their shock at how small a percentage of those using the name would be able to define any method to go with it. Let’s do our part to change that right now (with the next post, “Introducing the Method”). I have been a Methodist since before I was born. My great-grandparents started a Methodist church in their home in the late 19th century in Texas. About fifty years later, my grandparents donated land so that a Methodist church could be planted for a community of oilfield workers. When I was a boy, my parents helped to start a new United Methodist church in our community. I was raised in United Methodist churches, have served on staff in some of them, and continue to call this tradition my home. However, I have not always loved my home as much as I do now. There was a time when I was tired of my home and thought it didn’t have much of the life I wanted. Disillusionment was quickly weakening my youthful desire to give my life to Christian ministry when, by God’s grace, I stumbled into what sometimes gets called the “spiritual formation movement.” I was listening to teachers from a wide variety of backgrounds (names of Baptists, Quakers, and Roman Catholics quickly come to mind) who were pointing me toward an understanding of a way of life that could be shaped around God’s grace. Although I couldn’t yet recognize why, I felt very at home in the ways they were teaching about God’s grace, spiritual practices that could open us to it, and how it is helpful to get together in groups with others who are seeking to live this way. When I was in graduate school studying Methodist history and theology, I discovered why the spiritual formation movement felt so much like home, as I could see it as a direct echo of the early Methodist movement of the 18th century. I discovered––to my own surprise––that my home tradition offered reliable, substantive, and practical guidance (i.e. a method) on how we can arrange our lives around God’s grace in a way that increases our ability to love God and others. One of the tasks I now enjoy most is to describe the method of the early methodists to folks who may already have deep roots in the Wesleyan tradition–whether in a group that still uses the Methodist name or elsewhere. 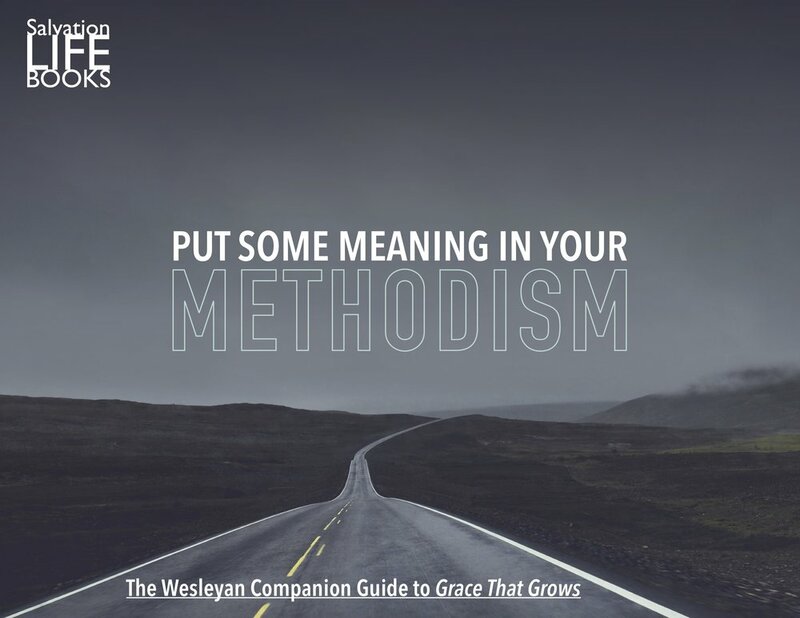 While Grace That Grows explores this method in fuller detail for all Christians, this brief guide is a summary of what I have discovered as the meaning in my own Methodism. “Hey Methodists, this is the core of our tradition! So to accomplish that reinforcement, I decided to put together a brief ebook to help make the big ideas of Grace That Grows clearly applicable in any groups which trace their roots through the Wesleys. I think it was a good idea, and like many things I’ve thought were good ideas, I started it and never finished it. In contrast to what you may have heard, Methodism is not in crisis. On the contrary, from my point of view, Methodism—both in our local congregation and beyond—is as strong as I have seen it in my lifetime, perhaps even on the verge of thriving beyond what any of us have seen in our lifetimes. a theology which emphasizes God’s grace as being given in abundance to each and every person, as the only thing which gives us hope of being able to freely and genuinely love God and others. Christians of any denomination who self-identify as traditionalists, progressives, or anything else can live by this method, and Methodism will continue to thrive. Those who attend the same local congregation of the United Methodist Church as I do can live by this method, stir the work of God’s grace in one another, and Methodism will thrive among us. In recent years, I have seen more people than ever before in my lifetime living as Methodists in this way––many of whom are not United Methodists, and some of whom are. In the recent life of our local congregation, I have seen more people living as Methodists in this way. Our community, our denomination, our world, and––certainly––my own soul need this kind of Methodism to continue to grow and spread among us. May we continue to invite one another further into this method so that God’s grace can run more fully among and through us. * There is an important dynamic here, which has been in place since our beginnings: Methodism and the life of any denomination (whether or not that denomination has the word “Methodist” in its name) are related to each other, but are not the same thing. In Wesley’s day, the primary denomination in relation to Methodism was the Church of England, and in regard to my local congregation today, it is the United Methodist Church. This is illustrated by the irony that it is largely from folks in other denominations that I have come to love, practice, and communicate Methodism as described above. Dallas Willard (ordained as a Southern Baptist) was the first to plant in me a deep love for John Wesley’s theology, particularly in regard to the centrality of God’s grace, and the Renovaré groups inspired by Willard’s teachings are good examples of the thriving of Methodism. Ruth Haley Barton has never been part of a Wesleyan denomination, but I believe the thriving her Transforming Communities is a good example of the thriving of Methodism. James Bryan Smith is an ordained United Methodist pastor who teaches at a Quaker university. I do not see his name and voice included in the current United Methodist denominational issues, but he is among the most influential and effective teachers of Methodism as outlined above. **Wesley’s original third rule was “attend upon all the ordinances of God.” By saying “use the means of grace” instead, I think I’m staying true to both his language and his intent.